Over 80 excited students proffered their “egg-o-nauts” for 50-ft test drops from the Santa Maria Fire Department’s ladder truck. Each of these creations sheltered a raw chicken egg in a custom-designed mantle. Each had a maximum mass of 100 g and could not employ a parachute. 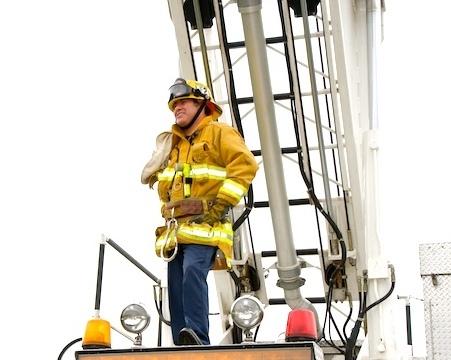 A continuous light rain could not dampen the excitement as Battalion Chief Alan Widling and Engineer John Sabedra lifted the egg-o-nauts to 50 feet and dropped them to marvelously ingenious landings as well as spectacular splats. Outstanding Endeavour Academy instructors Ty Fredriks and Josh Mason had indeed challenged these students to show great creativity and problem-solving skills as they engineered each unique design. The 50-ft drop survivors were then tested from the very top of the fire ladder at 90 ft until just six remained. These seemed indestructible from any height. Clearly they are the winners of this design challenge. I loved this event in my HS Physics Class. I was the only one who managed to keep their egg from breaking. I buried it in a bag of flour. The exploding bag of flour took the force leaving the egg intact.